As a life-long, hands-on builder, Specialized Homes founder Bob Niemann understands the value of craftsmanship. Each Specialized home undergoes a process of diligent quality control and inspection, ensuring that everything behind the walls receives the same attention and care as the fine finish details. As a hands-on builder, he anticipates your questions and is able to provide you with the detailed information you need to make decisions easily and efficiently. to the Master Builders Association commitment to 100 service projects in 2009 for their centennial celebration. Vision House was honored to host a group of MBA employees and Specialized Homes member Geralyn Haddow who painted a unit to prepare for a new family that will be moving in. Interested in hearing more about our new and upcoming communities? Click here to be added to our"Coming Soon" mailing list. 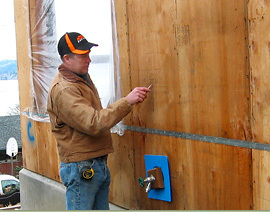 "Each Specialized Home undergoes a process of diligent quality control and inspection."